This is a very supportive while comfortable pillow. I suffer from a neck injury and this pillow helps me sleep! 1221 Bedding presents our best selling pillow. 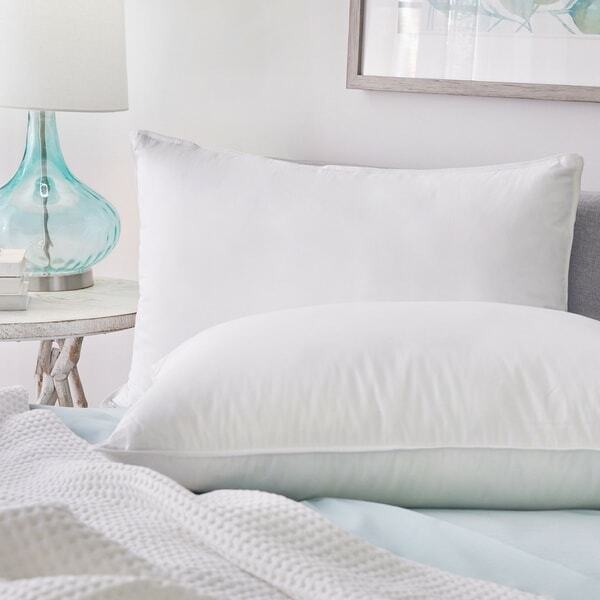 This 100% Cotton pillow is a unique combination of feather and down to create a perfect place to rest your head. The pillow is accented with double needle edges and German Cotton piping for durability. This unique construction has a feather core to help with stability in the pillow. A luxurious white down surrounds the feather core for an incredibly soft place to lay your head. The down used in this product has been certified to the RDS standard by control union. This pillow comes in Standard/Queen (20x28) and King (20x36). Love this pillow, pillow shopping is the worst, about 1 out of 10 pillows I buy is comfortable and this one is it. Had a great nights sleep on it. I always have a firm pillow and a soft pillow on top, I sleep on this pillow all by itself. This pillow is so soft and it feels really nice around my head. I bought the king size so I could sleep on it in many differant positions. Sometimes my head sinks in the middle and I find myself moving around and ruffling it up just a bit. Never the less, I always find a real good position and feel rested when I wake up. Feather pillows are a serious buying product. Are they for show or to use. I have recently moved, and in doing so got rid of ‘very good feather pillows’...they had served me well for 5 years. The pillows I ordered came each in there own box with a zippered protect casing. They are divine. I had need new king size down pillows for our bed. I’m extremely picky...I love these pillows. I will buy them again for the other bedroom. The pillows I had before cost me $220 each. To me if you can afford them...your sleep is better, then go for it. The price and quality of these could rival the old ones. They are wonderful. Great for side and back sleeper. Have been looking for a long time for the right pillow. This is it! After the first week I bought a second one. Both arrived quickly and in great shape. Because I liked the description. "What exactly is a chamber pillow?" A chamber pillow is one where there are 3 chambers on the inside of the pillow that are filled, usually with different types of fill. In this case, the center chamber is filled with feathers – this gives a nice sturdy center support for your head and neck. The outer chambers of this pillow are filled with white down which give you a super soft area to lay your head.